Aim: Road traffic accident has become a menace in today’s expanding era. The traumatic injury caused due to such accidents hampers the normal life of the patients. These injuries are very dangerous and may even possess threat to life. These injuries often result in deep lacerations with tissue loss giving rise to ugly scar and even marked facial disfigurement. Surgical esthetic primary closure of soft tissue laceration is a challenge for oral and maxillofacial surgeon. The aim of this commentary is to present a case report of a 19-year-old female patient with lacerated wound in the midface region which had a coincidental resemblance to a modified Weber Ferguson incision. Conclusion: An uncommon resemblance of a traumatic laceration with well-known Weber Ferguson incision and its management has been discussed in this report. Clinical Significance: Clinical alikeness of such incision is a rare entity, and the importance of early esthetic primary closure of this ugly injury is an important treatment aspect for the maxillofacial surgeons. Esezobor EE, Obasikene G, Dongo AE, Amuwha GO, Ukponmwan EM. Pattern of facial laceration in suburban plastic surgery practice. J Trauma Treat 2013;3:2167-1222. Leaper DJ. ABC of wound healing: Traumatic and surgical wounds. BMJ 2006;332:532. Bhattacharya V. Management of soft tissue wounds of the face. Indian J Plastic Surg 2012;45:436. Akheel M, Tomar SS, Bumb SS. Emergency esthetic closure of scalp in a rural setup: A case report. IJSS J Surg 2015;2:12-4. Khare RJ, Galinde J. Study of pattern of soft-tissue lacerations of maxillofacial region in relation to etiology of Injury and its management. J Contemp Dent 2015;5:90-2. American Academy of Pediatrics. First Aid for Families. Burlington, MA: Jones & Bartlett Publishers; 2011. p. 39. Nicks BA, Ayello EA, Woo K, Nitzki-George D, Sibbald RG. Acute wound management: Revisiting the approach to assessment, irrigation, and closure considerations. Int J Emerg Med 2010;3:399-407. Peterson AS. The “golden period” of wound repair. J Lanc Gen Hosp 2010;5:134-5. 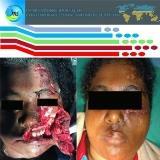 Infection in the Craniomaxillofacial Trauma Patient. In: Book: Head, Neck, and Orofacial Infections. Missouri: Elsevier. Infection in the Craniomaxillofacial Trauma Patient; 2016. p. 342-52. Fernandes R, Ord R. Access surgery for oral cancer. Oral Maxillofac Surg Clin 2006;18:565-71. Weber O. Presentation of a diseased resection of the lower jaw hindering the naturist. Med Association Heidelberg 1845;4:80-2. Ferguson W. In Operation of the Upper Jaw. A System of Practical Surgery. Edinburgh: John Churchill; 1842. p. 484. Rajasekhar G, Vura NG, Sudhir R, Dhanala S, Alwala AM. Versatility of dieffenbach’s modification of weber fergusson’s approach for treatment of maxillary pathologies. J Maxillofac Oral Surg 2012;11:416. Bhavana K, Tyagi I, Ramani MK. Modified incision for maxillectomy: Our experience. Indian J Otolaryngol Head Neck Surg 2012;64:184-7. Andi KA, Holmes SB, Hutchison IL. Infraorbitalorbitotomy: Modification of the weber-ferguson approach. Br J Oral Maxillofac Surg 2010;48:44-5. Paluch J, Markowski J, Pilch J, Piotrowska–Seweryn A, Kwiatkowski R, Lewin-Kowalik J, et al. Interdisciplinary surgical management of orbital and maxillo-ethmoidal complex disorders. In: Clinical Management and Evolving Novel Therapeutic Strategies for Patients with Brain Tumors. New York: Intech Open; 2013.